BizenYaki pottery is crafted using Japan's oldest pottery making techniques. It first evolved from Sueki pottery, that was made in the Heian period. The Momoyama period (1568-1600), was the golden age of art in Japan. The great lord Toyotomi Hideyoshi and great tea master Sen no Rikyu both loved Bizen ware and greatly supported it. Many tea ware masterpieces were made during this period. 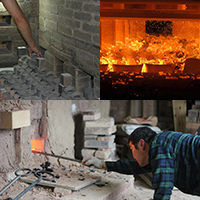 A key feature of Bizen ware is that the wood-burning firing process brings out the natural colors and tones of the clay. No applied glazes are used. Still today we use no chemical fuel, heating our kiln up to 1300 degrees over two weeks using only wood from Japanese red pines. Each piece displays a balance of natural beauty, originality and harmony. The natural elements ensure all of our pieces are both attractive and tasteful. The Bizen ware tradition also reflects Japanese artistic sensibilities with an emphasis placed on inner beauty and subtlety. Although It takes much time, money and labor to make Bizen ware, Bizen ware has never stopped production for a thousand years. The more you use it, The better you understand it. If it's used daily, the color and gloss on it becomes much better and deeper like leather by absorbing oil from the hand and alcohol. Moreover, Bizen has a miraculous power of making water and Sake tasty. 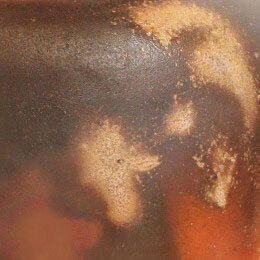 If you pour beer into a Bizen cup, the bubbles become long lasting and fine- grained, so beer is pleasant to the taste. It also has a power of preserving fresh water, so flowers in Bizen vases are long lasting. This happens because of the unglazed surface of the ware. 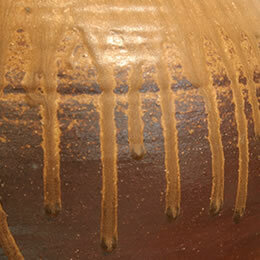 Bizen ware contains much iron in the clay, so it has excellent ability to retain heat or coolness. We can enjoy every drink at it's best. We beat rice straw with a mallet to soften it and, then wrap the wares with it. We place them in saggars to prevent the flames from touching them and insert them into the kiln. Finally the rice straw burns off. The iron in the clay and alkali in the rice straw create a chemical reaction inside the kiln resulting in the red color. Thanks to this chemical reaction, traces of the rice straw create a pattern, resembling the flames. This feature is seen beautiful brown, red and cinnabar colors. The San-giri is a representative example of a unique coloration of the ceramic ware. Its main colors are gunmetal grey, dark grey, blue and white. San-giri appears in some places because of the reduction in the firing process, when the embers fall on the wares. This feature is caused by the chemical reaction of the iron contained in the clay with the carbon from the embers. Red pine ash adheres to the ware and melts at a temperature of 1200℃. 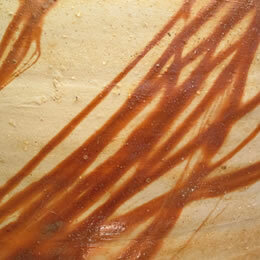 It acts as a natural ash glaze, giving the pieces a beautiful, brown color, which resembles sprinkled sesame (goma) seeds. Ao-Bizen can be translated as "blue Bizen". The ware acquires various blue hues according to the amount of reduction, from light blue (heavy reduction) to brownish (lighter reduction). The method is almost the same as that of "Hidasuki". But at the end of the firing, charcoal is placed on top of the saggars, completely covering them. The burning charcoal consumes the oxygen in the kiln creating a strong local reduction atmosphere. So the only difference between red (Hidasuki) and blue is the oxygen concentration during the firing. It is very difficult to control all of the elements needed to create "blue Bizen", so this color is very rare and prized by connoisseurs. These rare wares are obtained only near the firemouth. They are fired in a severe atmosphere being struck by firewood and buried in embers. At high temperature the ash melts creating beautiful and dynamic wares. 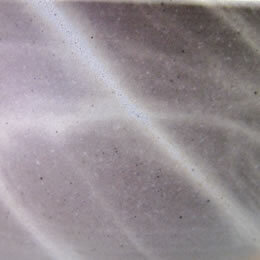 The melting ash often sticks to the kiln or other wares. So only a small percentage can be used. 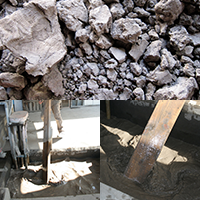 Sources of good clay are located in the city of Bizen, Inbe and Kagato. The soil taken is from rice fields, approximately 2 meters below the surface during the winter season. Because the fresh soil is susceptible to damage during the firing process, we expose it to fresh air and let it stand for few years. The longest term is more than 10 years. Next, the clay is pounded, dried, dunked in water a few times, leached and then the best part removed for later use. 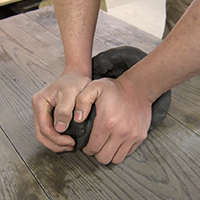 To ensure that the clay will not crack under the intense heat of the firing process, it must be well-kneaded, removing any trace of air. 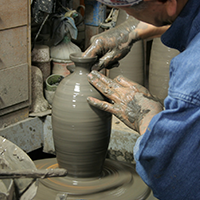 Some items are formed using the potter's wheel. Some figurines are formed using several plaster moulds that are assembled. 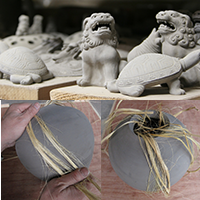 Because Bizen ware is un-glazed, and the clay contracts or shrinks during firing, proficient skills by master craftsman are required in order to form thin and light wares without any cracks. Items are dried naturally and slowly in the shade to prevent warping. Most Bizen ware companies use noborigama, which are climbing kilns, and red pine for the firing process. In our kiln, we use more or less 4000 pieces of firewood and maintain a temperature between 1200 and 1300 degrees for about two weeks. Then we use 150 bags of charcoal. 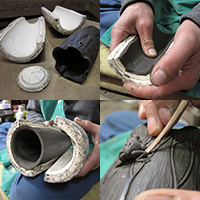 When the firing is finished, the kiln is cooled down for 10 days and the pieces are removed. After that, we check whether there is any leakage and the work is completed. 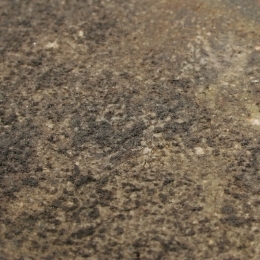 Bizen ware is well vitrified and so it does not leak. It is strengthened by the long firing. On the other hand, it is sensitve to high temperature and rapid cooling, so please be careful when you use Bizen ware with hot water. To make it stronger before using, place it in cold water and bring to a boil slowly. Then, let it cool naturally. avoid heating with direct fire. avoid dunking in boiling water. avoid heating in microwave oven.